Isuzu FRR 260 Hi-tensile polished aluminium bullbar. Heavy duty hi-tensile box uprights and 6mm all 73mm diameter hi=tensile tube for maximum cab protection. Custom driving light mounts and mount for light bar. Custom made contoured hi-tensile aluminium main channel includes air vent with mesh. Bull bar is mounted with a hi-tensile aluminium backing plate with tow pin. 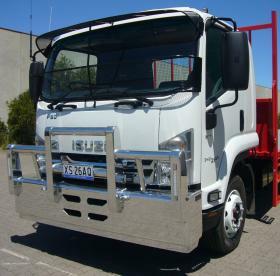 Isuzu FSD260 FUPS compliant custom built polished high tensile aluminium bullbar . Extra deep main channel with additional rear webbing for additional strength, heavy duty 6mm wall box uprights. This bar has been custom built with "C" type extrusions as the main cross pipes to allow for the easy mounting of custom driving lights and light bars, aerials etc. The outer uprights are fitted with combination parker/indicator repeater LED lights. Additional vertical high tensile 6mm wall pipe are fitted between the outer upper rail and the main channel to afford extra protection to the cab.The lower cutouts in the main channel assist in keeping up a good airflow to the engine compartment. 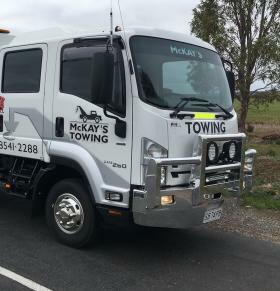 Contact us today for your custom designed bullbar.